Take a length of thin copper wire and place its tip between the pliers. Place the wire as close to the hinge as possible and squeeze hard. The result should be a flat section at the end of the wire. Squeeze harder for a wider and flatter section, or less hard for a narrower and thicker section. 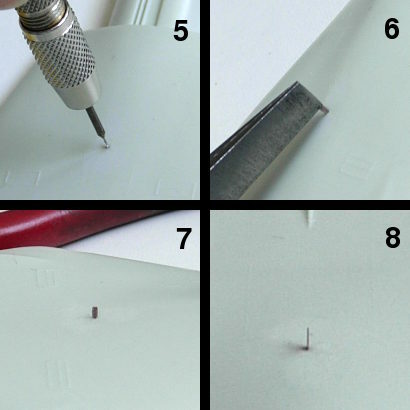 Trim the flat section to the shape of an antenna using a diamond file or a hobby knife. I prefer using an old blade for cutting copper wire as razor sharpness is not required and cutting copper will dull the blade. Only cut the antenna on a hard surface, a soft surface such as a cutting mat or a piece of cardboard will cause the antenna to bend. Once the antenna has the required shape, cut it off the wire, leaving a small section (about 2mm) of unsquashed wire as a mount. Use a pin vise with a drill bit of the same diameter as the wire used for the antenna and drill a mounting hole in the model. Push-fit the antenna into the hole. With a small antenna I prefer using a pair of pliers to avoid bending it. If the wire fits snug into the hole I just leave it, if it fits loose I lift it out of the hole again, apply a bit of superglue to the base of the antenna and put it back into the hole. Use the pliers to align the antenna (do so before the superglue cures). The final two pictures show a tiny blade antenna on the back of a 1/72 scale F-111 model, picture nr.7 is an actual size side view, picture nr.8 is an enlarged head-on view. 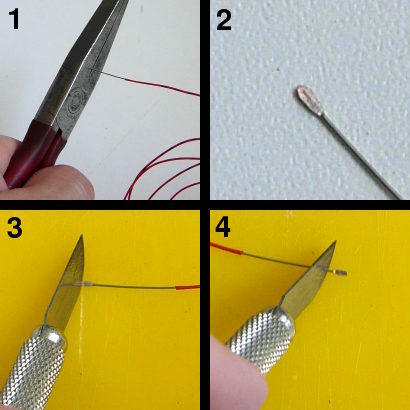 With a bit of practice and some different sizes of wire, a wide range of shapes can be made using this technique. It is even possible to create rows of vortex generators.